Los Angeles circa 1953. 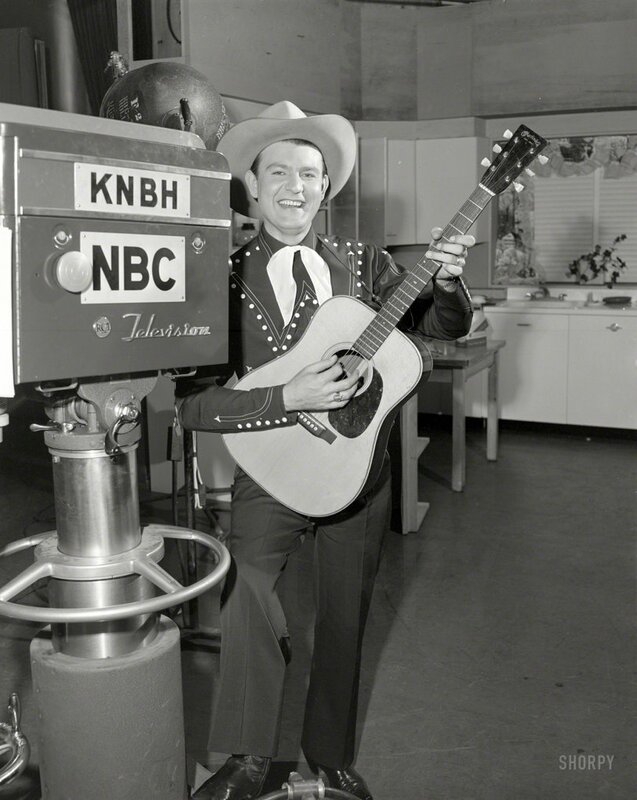 "Tex Williams, host of Town Hall Party on KNBH-TV." The country singer known for "Smoke! Smoke! Smoke! (That Cigarette)." 4x5 acetate negative from the Shorpy Publicity Department archive. View full size. Submitted by Jano on Tue, 08/28/2018 - 5:21pm. I am not ashamed to say that Jim Page's comment made me tear up a bit. My dad did smoke, smoke, smoke that cigarette but he also play, play, played a 1943 Martin. He's gone but the guitar is currently in the hands of a Martin-certified craftsman being senstively refurbished after being abused by someone who never should have had their hands on it. It won't be the same but it will be returned to playing form and gifted to a deserving grandchild. Submitted by Jim Page on Thu, 12/10/2015 - 5:28am. MacKinzie, you are indeed lucky to have your Martin. An instrument like that instructs the player, in my opinion. I can only imagine how sweet it sounds. I think the 0-sized Martins are the best-sounding of them all. They may not boom like a dreadnought, but they caress the ear. My best friend for over 40 years developed a terrible medical problem, and his wife and sister told me they were afraid he was giving up. I sent him my 1953 0-18 with this note: "My most cherished friend now owns my most cherished guitar. I can find another best guitar, but not another best friend. Now get out of bed, play this thing, and beat that problem of yours." He did, and he did, and he did. That was over five years ago, and he's still playing that little Martin, which is on a stand in his bedroom. He keeps it there, he says, so it's the last thing he sees at night and the first thing he sees in the morning. Are some Martins more than just a guitar? I think so. Submitted by MacKenzie Kavana... on Wed, 12/09/2015 - 4:00pm. Thank you, Paul A and Mr. Page, for your knowledge and appreciation of Martin guitars. I have an O-17 (given to my mother, new, in 1937)which I have played (not well) most all my life, And, gentlemen, it just rings like a bell. I am one lucky dude. Submitted by Paul A on Mon, 12/07/2015 - 6:27pm. I wonder if those steel cupboards sang along? Thanks Mr. Page. I was wracking my brain as to why those tuner buttons looked so familiar. These Martins are so timeless that Martin keeps rereleasing older designs. I currently have a two-year-old D18 (1935 design) with a 32 bit d-a, 10 microphone emulator pickup. Submitted by Jim Page on Mon, 12/07/2015 - 5:23pm. Tex's lovely Martin D-28 seems to have replacement tuners. Those Deluxe Klusons were more often seen on Gibson guitars; Martin usually used Klusons with metal buttons.